Our unique core curriculum sets us apart and is what allows us to be the gold standard for Catholic liberal arts education today. “General education” requirements in the disciplines of history, language, literature, and philosophy—not to mention theology—have all but disappeared in today’s top institutions. 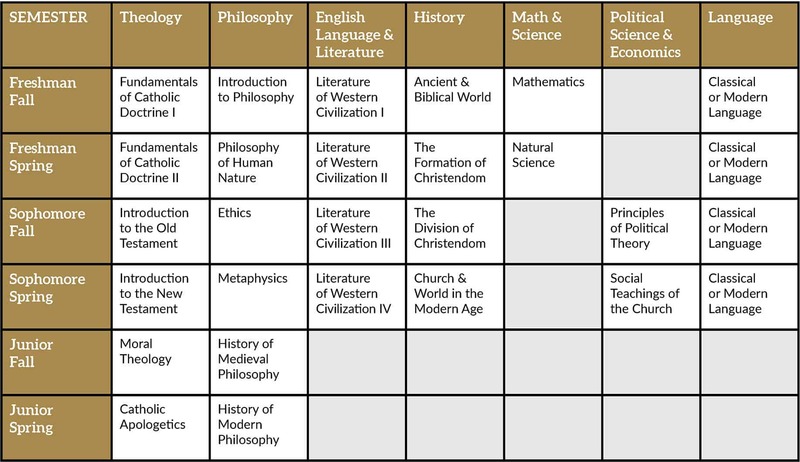 In stark contrast, Christendom College’s core curriculum consists of 86 semester hours of carefully structured courses in Catholic theology and philosophy, the history and literature of Western civilization, classical and modern languages, political science and economics, and mathematics and science. It is designed to provide an orderly, sequential presentation of the fundamental principles of mathematics and natural science, philosophy, and theology, in conjunction with the historical and literary knowledge which is foundational for an understanding of Western civilization. Yes, those are real students. And yes, that is St. Peter’s in the background. 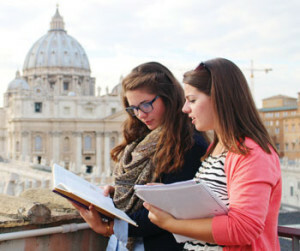 Our classrooms are located right next to St. Peter’s, so why not do a little reading on the terrace on a beautiful day? Find out more about our Junior Semester in Rome by clicking on the image above. Christendom College’s exploration of truth conjoins natural and revealed truth, so that each can inform and benefit the other. The first year of study includes both a systematic exposition of the fundamentals of Catholic doctrine and philosophic study of the ancient philosophic wisdom of Plato and Aristotle and St. Thomas’ philosophic understanding of the nature of the human person. In the second year this understanding of God, the world, and the world’s and especially man’s relation to God is deepened and enriched by year-long study of Sacred Scripture in Theology and of ethics and metaphysics in Philosophy. An indispensable element in any sound education is learning to distinguish truth from error or distortion, and then to communicate truth accurately, effectively, and convincingly to others. Therefore, Christendom College requires an introduction to the fundamental questions and methods of philosophy, the study of logic, mathematics and scientific thought, and training in the arts of discourse, along with at least four semesters of a foreign language. The study of a foreign language, particularly of an inflected language such as Latin or Greek, leads the student to an understanding of the nature and structure of language as such, and hence to a true command of language. Furthermore, foreign language study both enhances linguistic skills and enables the student to gain a fuller appreciation of the European roots of American culture, a purpose which is also served by four courses each in the great heritage of Western literature and the history of Western civilization. For these reasons, Christendom College’s Core Curriculum includes a foreign language requirement as an essential component of its B.A. educational program. A minimum of two years of college-level work in a single foreign language, classical or modern, is required for graduation from Christendom College. Language competence must be proven by college course work at or above the second-semester Intermediate level. Advanced proficiency in a language achieved through a medium other than college-level courses may exempt a student from lower level courses, although no college credits are granted without college course work. No substitutions for or exemptions from this requirement for proven competency in a foreign language are allowed for the B.A. degree. The language requirement for the A.A. degree is somewhat different from that of the B.A. degree, however. The transformation of all history by the Incarnation makes a truly Christ-centered study of the past an indispensable hallmark of a Christendom education. Without this focus, it is nearly impossible to truly understand the present and shape the future. You will examine the formation and disintegration of Christian culture from ancient times to the present and investigate the historical consequences of thoughts, teachings, writings, and ideas in the areas of philosophy, political science, theology, and literature. You will be equipped with a well-formed and broad understanding of the past. This focus on history will assist you as you go on to make history yourself. In addition to the above-mentioned core classes, all students participate in the Education for a Lifetime Program (ELP), which offers two classes (CCOL 101, CCOL 301) worth a total of two credits over the course of four years. More information about this unique program designed to help students excel in their post-graduation life may be found here.